Plants have an amazing variety of methods to acquire energy and nutrients, and their genomes are equally diverse ranging from highly complex ultra-large, to miniature and specialized. Darwin ended his book Insectivorous Plants with a technical description of a newly discovered (circa 1833) carnivorous plant Genlisea ornate, also known as the “corkscrew” plant (Darwin 1875, pg 446-452; Figure 1). Darwin described the photosynthetic leaves that emerge from the soil and the subterranean non-photosynthetic tubular leaves (achlorophyllous rhizophylls) that twist into the shape of corkscrews to catch protozoa and soil microorganisms (Figure 2). 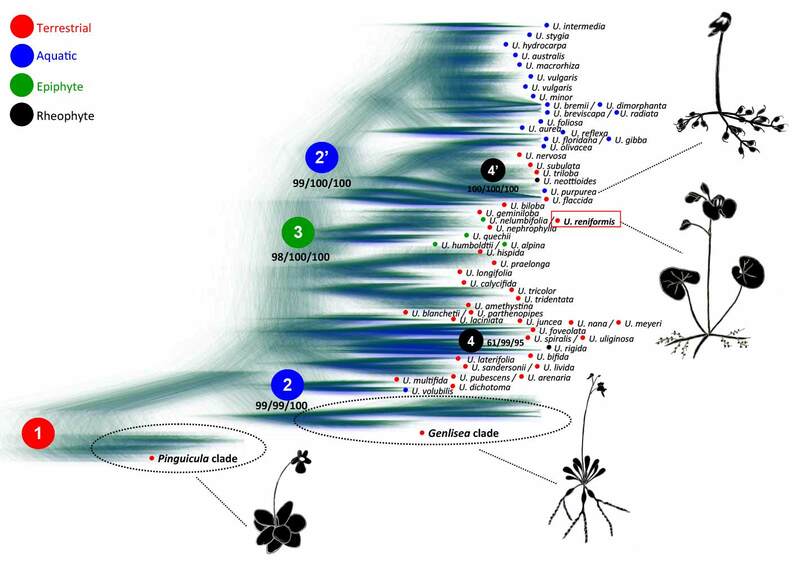 Genlisea, and its sister genus Utricularia, have the smallest known flowering plant genomes between 60-80 Mb megabases (Fleischmann et al., 2014); this is half the size of the model flowering plant Arabidopsis thaliana (157 Mb). The Utricularia gibba genome has undergone multiple rounds of whole genome duplication and then reduction to maintain its slim 80 Mb genome (Ibarra-Laclette et al., 2013). Figure: Cloudgram (Bayesian inference) of Lentibulariaceae from 18,000 Bayesian trees based on matK cp gene. The red circle 1 indicates the terrestrial ancestral lineage for the Lentibulariaceae family. The blue circles, 2 and 2’, represent the independent radiations to the aquatic habitat of Utricularia lineages. The green circle 3 indicates the possible ancestor of the epiphytic species from the plesiomorphic terrestrial life form, and the black circles, 4 and 4’, represent the independent origins for the rare reophytic life form for Utricularia lineages. Numbers below clades represent the support (maximum parsimony bootstrap/ maximum likelihood bootstrap/ posterior probabilities based on Bayesian inference). Higher color densities represent higher levels of certainty represented by congruent trees (from the 18,000 trees). We hypothesized that the genomes may be small due to increased molecular evolution as a result of increased reactive oxygen species from their carnivorous eating habit (Albert et al., 2010). Genlisea, Utricularia and Pinguicula, the third species in the Lentibulariaceae, have diverse trap architecture, body plans and growth conditions (terrestrial vs. aquatic; Figure 3), and we were able to provide initial support for our genome reduction hypothesis by looking at variation across chloroplast genomes (Silva et al., 2016; Silva et al., submitted 2017). The rapid mutagenesis and duplication/reduction in the Genlisea and Utricularia genomes provide a natural minimal plant genome platform to develop and refine design principles for building a synthetic plant. The Chloroplast Genome of Utricularia reniformis Sheds Light on the Evolution of the ndh Gene Complex of Terrestrial Carnivorous Plants from the Lentibulariaceae Family. PloS one. 2016-01-01; 11.3: e0165176. Annals of botany. 2014-12-01; 114.8: 1651-63. The carnivorous bladderwort (Utricularia, Lentibulariaceae): a system inflates. Journal of experimental botany. 2010-01-01; 61.1: 5-9.